Earlier this week, hundreds of CWA members from the Telecommunications and Technologies (T&T) sector joined with passenger service agents to protest poverty-level wages at American Airlines. 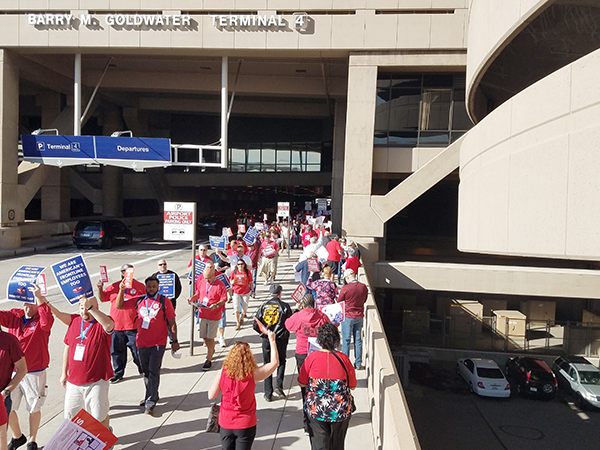 At the rally, held at Sky Harbor International Airport in Phoenix, Ariz., agents and allies called on American's wholly-owned subsidiary airlines, Piedmont and Envoy, to negotiate fair contracts and end the pay gap between regional airlines and mainline carriers. 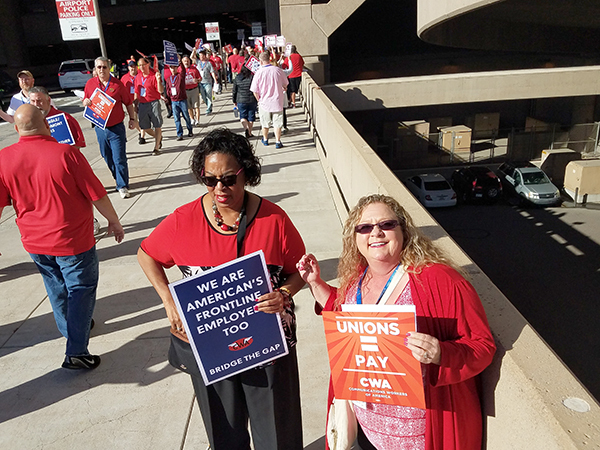 "We're taking action in solidarity with our fellow CWA members at Piedmont Airlines and Envoy Air," said T&T Vice President Lisa Bolton. "Workers at Piedmont and Envoy make lower wages and have fewer benefits than their co-workers at American, even though they all work for the same employer. This situation is unfair, and it's unsafe. Low wages and poor benefits mean workers often work more than 60 hours a week and many rely on food stamps and other public assistance just to survive. Every frontline employee at American deserves a fair wage and good benefits." Jamie Lynn McClay, a Ramp/Operation Agent for Piedmont since 2013, explained what's at stake. "We are serious about getting livable wages, better health care for all of our agents, and better treatment at all stations in our company. We want the rest of the negotiations to go smoothly, but Piedmont has to understand that we will not just take any offer placed on the table. We have to have the company understand it has to be fair and equal." The T&T members were in Phoenix for the 2018 Telecommunications and Technologies Leadership Conference. 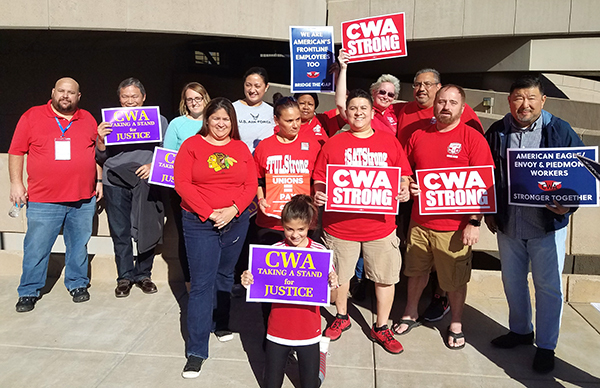 District 3 Vice President Richard Honeycutt, who is also chair of CWA's Airlines Council, District 7 Vice President Brenda Roberts, and District 4 Vice President Linda Hinton also rallied with the agents. The event received extensive media coverage from local news outlets including the Arizona Republic, KSAZ FOX 10 News, and public radio station KJZZ. The airline industry site Aviation Pros also covered the protest. Recently, American Airlines announced a one-time bonus for employees after the passage of the tax bill, but it hasn't budged on the real issue – permanent, sustainable worker wages. CWA represents 4,600 Piedmont agents nationwide, 3,800 agents at Envoy, and 14,000 passenger service agents at American Airlines. Bargaining at Piedmont and Envoy resumes this month. Hundreds of CWA members from the Telecommunications and Technologies (T&T) sector joined with passenger service agents from Piedmont and Envoy to protest poverty-level wages at American Airlines. Below: T&T Vice President Lisa Bolton, (right), District 3 Vice President Richard Honeycutt, who is also chair of CWA's Airlines Council, District 7 Vice President Brenda Roberts, and District 4 Vice President Linda Hinton, (left), also rallied with the agents. Eight hundred social justice activists, union members, people of faith, elected officials, and others gathered in Houston this week for the annual AFL-CIO Dr. Martin Luther King, Jr., Civil and Human Rights Conference. The conference theme was "Reclaiming the Dream: Strategize, Organize, Mobilize!" For four days, participants took part in actions, meetings, trainings, and other sessions focused on building power so that all working communities can thrive and all families can achieve a fair return on their work and enjoy the fruits of their labor. 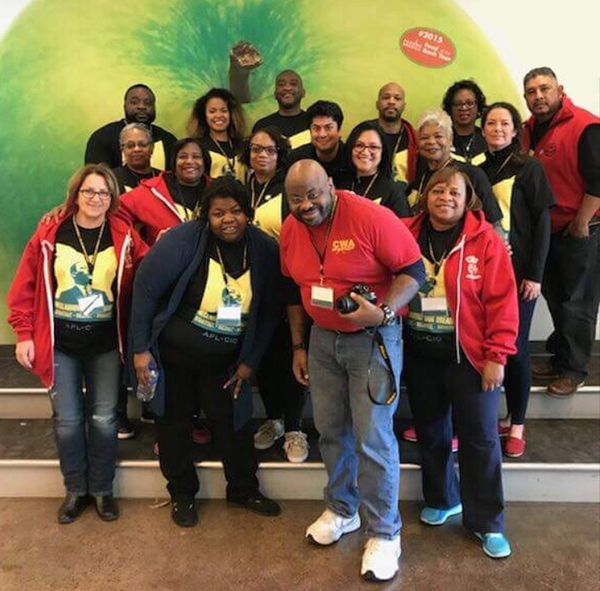 "We're fighting on the front lines of racial justice, social justice, and economic justice issues," said CWA District 6 VP Claude Cummings, addressing the conference. "Specifically here in Texas, for the last 30 years, we've been fighting a right wing agenda that seeks to systematically strip black and brown citizens of their right to vote, while enriching corporations through sweetheart deals. Dr. King's fight was not just against hate, but also poverty and economic injustice." Above: Conference participants joined the annual Houston MLK Day Parade. Right: CWA District 6 VP Claude Cummings spoke at the annual AFL-CIO Dr. Martin Luther King Jr. Civil and Human Rights Conference. Below: CWAers took part in actions, meetings, trainings, and other sessions at the conference. "Anytime we clear a street, we put our lives on the line," [Holmes Rollins] continued. "At 3 o'clock in the morning when me or one of my brothers or sisters walk up to a car, we don't know what we're walking into. Many times, we are assaulted and spit on; cars try to run us over while we just do our jobs. We're asking for what Martin Luther King was fighting for those sanitation workers. What they were fighting for years ago, we are still fighting for today: a living wage and our right to be treated like humanity." The parking production assistants, who number about 1,000 mostly African-American and Latino workers in New York, were given approval by the National Labor Relations Board to vote on whether they wish to be represented in labor negotiations by the Communications Workers of America. Ballots are expected to go out this week. A spokesman for the group said the workers get no medical or other benefits, earn minimum wages and typically work 12-hour shifts through the night to secure locations for filming. My name is Martin Yost. I’ve been a sign language interpreter for 29 years in universities, medical settings, legal settings, and anywhere else a deaf person would be. In 2007, I began interpreting Video Relay Service (VRS). VRS is new to interpreting because it is based on recently invented live-streaming video technology. The work happens in a call center environment where we interpret phone calls between deaf and hearing people remotely on video. VRS is some of the most difficult interpreting; it allows for no preparation like community (live, in-person) interpreting does. We have no idea what we are going to get hit with on each new call, so it’s stressful. While a busy community interpreter may have ten, fifteen, or twenty assignments a week, a VRS interpreter can fly through that many interpreting assignments in an hour or two on the video phone. In all my years interpreting, it never occurred to me that one day I would unionize – until 2012. Read Martin's full post, which is part of CWA's Customer Service Programs's Member Voices series, here. CWA D7 members attended Local Officer Training in Omaha, NE. After the Republican-controlled Federal Communications Commission (FCC) eliminated essential safeguards that ensure fair Internet access to all users, state legislators across the country are taking action to protect their constituents. Lawmakers in New York, Texas, Washington, Massachusetts, and Nebraska have all indicated that they will introduce state-level legislation. In California, SB 460 has already cleared its committee. The California Internet Consumer Protections and Net Neutrality Act of 2018, or SB 460, would restore the safeguards eliminated by Trump's FCC – no blocking, no throttling, and no favoritism. These rules will apply to wireline and wireless broadband providers. The bill also requires accurate broadband speed reporting by broadband providers and establishes a mechanism by which consumers can test their broadband speeds. "CWA has long supported clear rules to protect a free and open Internet," said CWA District 9 in a statement supporting SB 460. "The decision by the Republican-majority at the FCC to eliminate the rules that prohibit Internet Service Providers from blocking content, slowing down some Internet traffic, or giving favorable treatment to some websites and applications over others threatens essential safeguards that ensure fair Internet access to all users."